Efforts to halt the closure of the DWP benefits office in Merthyr Tydfil were boosted on Saturday (2 February) by a successful campaign event staged by the Department’s main trade union, together with local politicians. 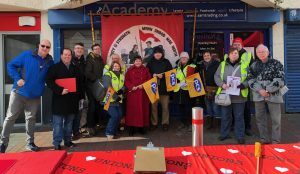 MP Gerald Jones and Assembly Member Dawn Bowden joined representatives from the PCS union and supporters from Merthyr Trades Council as they leafleted the town centre and collected signatures on a petition to save 200 jobs that are threatened by the closure plans. The campaigners were delighted that, despite the cold weather, they received a warm reception from Merthyr residents, almost 300 of whom signed the petition against the transfer of the work and jobs to a new site in Treforest.